The Evangelist Matthew writes: "Christ fasted forty days and forty nights and then was hungry. 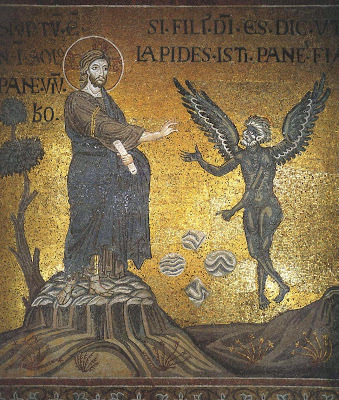 And the tempter came to Him saying...." The tempter came to Christ when He was hungry. Thus, hunger attracts him, but hunger is eventually what defeats him, when, of course, satisfaction is sought in the reasonable food of the soul - the words that proceed from the mouth of God - and not one-dimensionally from the unreasonable nourishment of the body. We must not, therefore, be surprised if during the fasting period of Great Lent diverse temptations occur, whether they relate to our personal, family or social life. 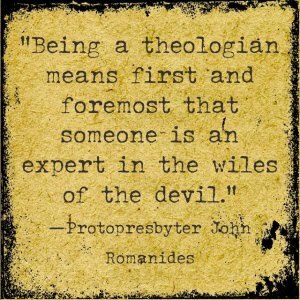 At this time the tempter "approaches" Christians. He does this through many "internal" ways, but also with noisy external events, which correspond to internal impassioned thoughts, and tries to make our struggle during Great Lent worthless. But if we are sober, all these things will cause our spiritual maturation, paths for deeper self-knowledge and the knowledge of God. Source: Ekklesiastiki Paremvasi, "Η νηστεία και ο πειρασμός", March 1999. Translated by John Sanidopoulos. Ultimately, to fast means only one thing: to be hungry - to go the limit of that human condition which depends entirely on food and, being hungry, to discover that this dependency is not the whole truth about man, that hunger itself is first of all a spiritual state that is in its last reality hunger for God. Fasting, then, means to be hungry. However, since hunger is confused with appetite for us who are dominated by pleasures, we must draw a clear dividing line between appetite and hunger. Recently, a dietician, commenting on various "weight-loss recipes" by which we could "lose weight through eating", noted the dangers of confusing appetite with hunger. For many, appetite is when we think we are hungry, which is why when we do not satisfy our appetite, we think we are depriving our body of the food it desperately needs. These thoughts paralyze the tone of the soul and creates the illusion of bodily weakness. This thought is an insidious temptation during fasting periods. From his own perspective, the dietician stressed that hunger is connected with the real needs of the body, while appetite is related to the desire and pleasure of food. The asceticism of Christian fasting teaches us that if we allow our appetite to be unbridled it will lead to gluttony. When according to Fr. Alexander Schmemann "to fast means only one thing: to be hungry", we must proceed with fasting to subjugate our appetite to our needs, and to reduce our needs to the minimum. At such a marginal situation we will be allowed to understand our "dependence on food" and discover that the actual content of our hunger should be our "hunger for God". Source: Ekklesiastiki Paremvasi, "Η νηστεία, η όρεξη και η πείνα", February 2001. Translated by John Sanidopoulos.